Strong the to finish, ‘cause they eat their spinach! The Factory Theater has a late-night theater offering, The New Adventures of Popeye – but one wonders whether it shouldn’t be pared down and placed just before Jenny & Jenni in the way that cartoon shorts used to warm up the audience in movie theaters before the feature. Directed by Eric Roach, with John Moran (Popeye), Sarah Rose Graber (Olive Oyl) and Dave Skvarla (Bluto), the team absolutely nail the cartoon mannerisms, voices and movement of their characters. 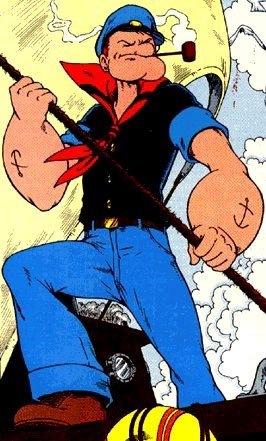 Their goal is to produce Popeye for adults, which in some ways is rather redundant, since the original cartoons always had Popeye mumbling witty asides that the adults could get a chuckle over, while the kids reveled in the cartoon’s hyperbolic physical comedy and routine sparring between Popeye and Bluto over Olive. Eric Roach and cast (which include Lina Bunte and Colin Milroy) also try to update Popeye with contemporary themes and concerns. For openers, Popeye and Bluto compete in selling their apples at a farmers market. Popeye’s apples are organically grown while Bluto’s reek of harmful chemicals. But the premise comes off as preachy more than funny; even now it’s difficult to see two iconically stereotypical seamen like Popeye and Bluto getting into farming, organic or otherwise. The other sketches prove to be much funnier: couples-counseling for Popeye and Olive Oyl, the travails of air flight for all three. I wonder if there’s still time to put in material about ex-ray screening and full-body pat downs. Whatever the case, the production comes off much cleaner when returning to the original comic structure of the cartoon, which has always been about two guys fighting over a gal—a skinny, rubbery, mewling kind of gal. Pleasant and pure nostalgia holds the audience, as well as marvel over the ease with which the cast physically and bracingly evokes the cartoon’s clownish effects. Oscar is messy. Felix is tidy. Oscar is brash. Felix is meek. Oscar likes gambling and cigars. Felix likes cooking and vacuuming. They’re both divorcees. They live together. They’re not gay. If you pitched this as a show concept to a modern-day television executive, he’d either laugh you out of his office or option it as the next banal reality TV show. Either way, the idea would be seen as too simplistic and naïve for a contemporary television audience. And that’s saying a lot, considering this is the same audience that demanded 11 seasons of “7th Heaven”. But back in 1965, this is exactly what constituted good theatre. That’s when Neil Simon’s acclaimed The Odd Couple—featuring the slovenly Oscar and the uptight Felix–premiered on Broadway, garnering that year’s Tony for Best Play. In fact, it was such a hit that it ran for 966 performances, took a leap to the big screen in 1968, jumped to the small screen in 1970, went animated in 1975 and was revived for television once more in 1982. 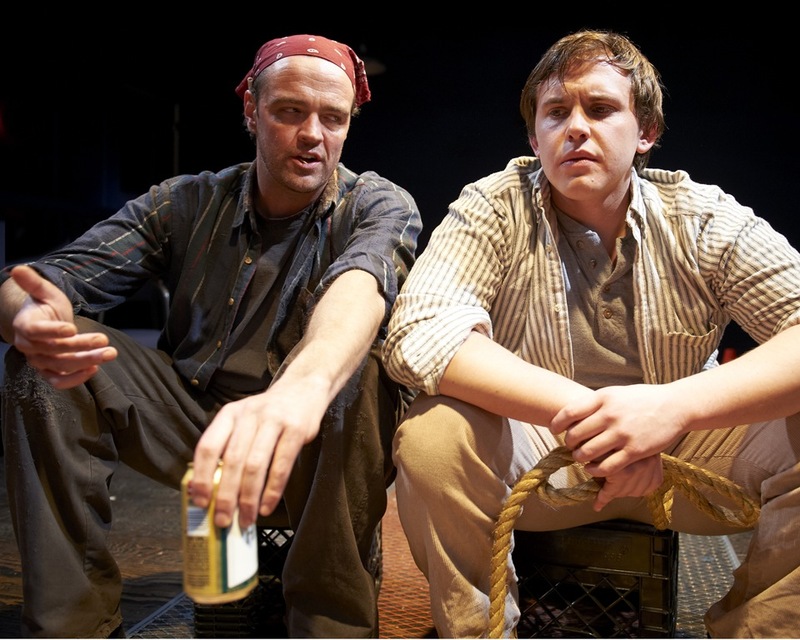 Now, the Raven Theatre Company, known for taking cracks at classics, is doing its own production. The Raven’s version is utter slapstick. Characters speak with Ralph Kramden growls and nasal newsreel voices. Their movements and reactions are exaggerated for comedic effect. When a scene calls for the emotion of surprise, the actors look as if they’re trying to pop their eyes out of their sockets. At one point, a character actually runs face first into a door when trying to stop a despondent Felix from going into the bathroom alone. I assume it was director Michael Menendian’s vision to do a live-action cartoon version of The Odd Couple, and unfortunately, the outcome is a terrible miscalculation. 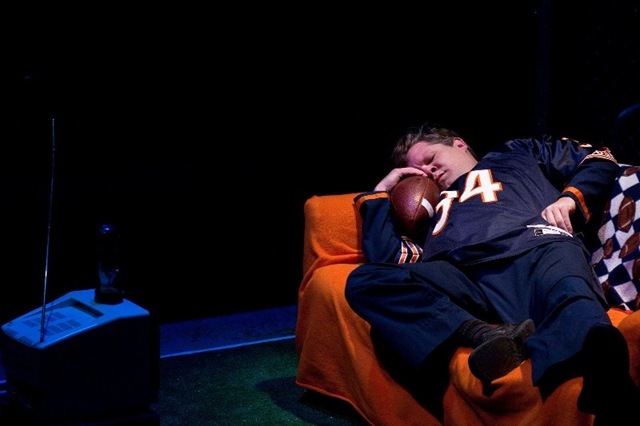 The play–which already struggles to connect with an audience who are more surprised to see a marriage last rather than end in divorce—comes off as vapid, void of any real meaning whatsoever. It’s like the tragedy that has befallen Felix (Jon Steinhagen) is one big joke. And we get no sense of Oscar’s (Eric Roach) own unresolved marital issues except for his messy condo, which is a parallel for his messy life. Instead, Menendian has reduced the story to a one-joke pony that keeps begging to be laughed at. Sure, at first it deserves a chuckle, but by the end it’s just kind of desperate. To their credit the cast is spectacular in their respective roles, even if the final outcome is damaged by misguided direction. 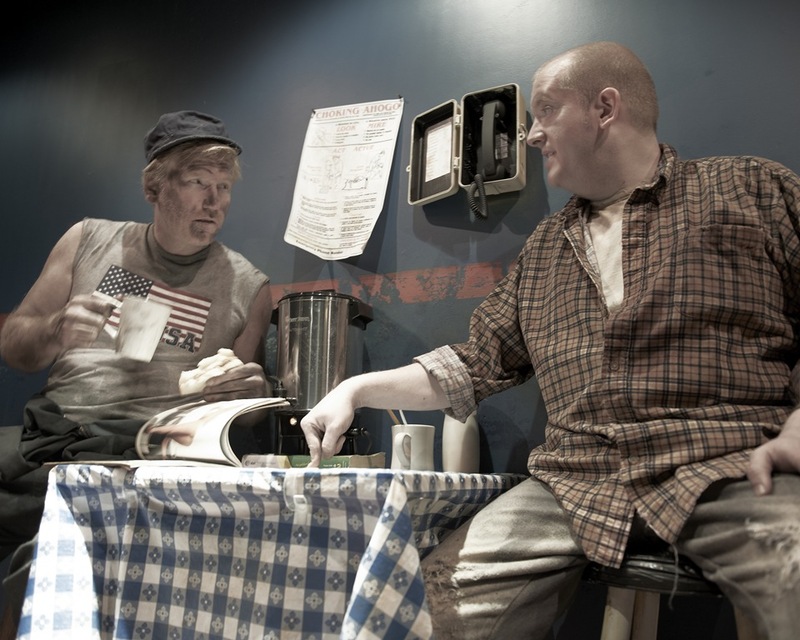 Roach toes the line with Oscar, portraying him as a slob but a fun slob. This is a guy who’s a borderline hoarder, but he’s also a wild and crazy guy. Steinhagen’s portrayal of Felix is a good balance to Oscar’s party-animal stereotype. He’s reserved, slightly effeminate and deeply emotional–or at least an emotional wreck, which is more than can be said about Oscar who takes a much more cavalier approach to his failed marriage. In the end, Raven Theatre lost an opportunity to give a fresh take on this well-worn classic. Personally, I would have liked to have seen Menendian take up the task of providing this fairly hollow play with some real emotional depth. Rather than take the easy slapstick route, why not venture on that high road and make the actors bring some realism to their roles? Let’s see The Odd Couple as a dark comedy for once. After all, is this not a play about two men whose marriages have fallen apart, whose families have been torn from them due to their own negligence? If it truly is a funny show, the humor should still shine through despite a graver tone. Still, there will always be an audience for schlock like this. Some people just don’t want to see something thought provoking or culturally relevant. Some people just want a show with uncomplicated laughs and a simple plot with characters as three-dimensional as a piece of construction paper. For those people, The Odd Couple will work just fine. 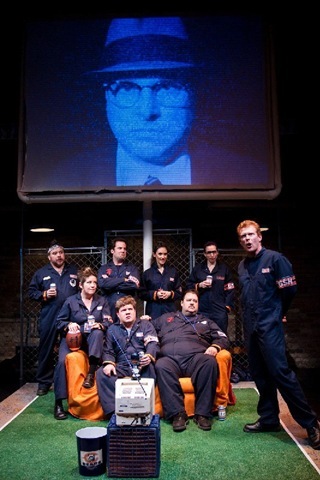 The Factory Theater’s 1985 is a work of true love, from beginning to end. 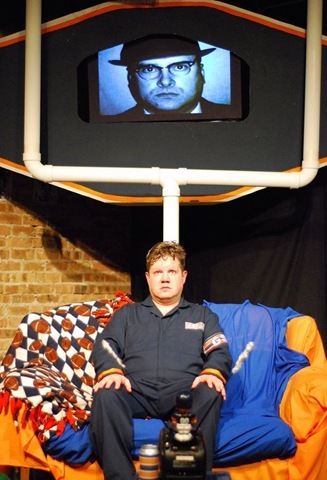 Chas Vrba is passionate about the subject matter, and it comes across in the concept and the layout of his farcical first full-length play. 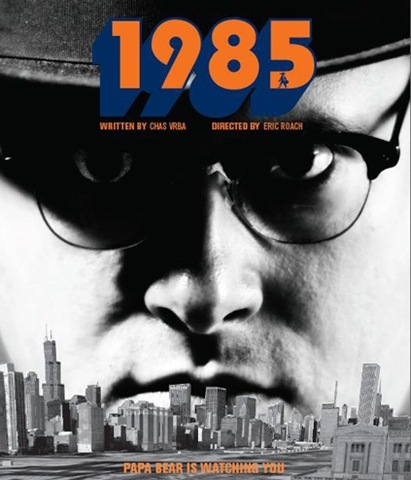 A re-imagining of George Orwell’s iconic science fiction novel “1984” set in 1985 Chicago at the height of the Bears season. Winston (Vrba) has the same name and function as George Orwell’s protagonist, but we never get much of a read on him or any of the other Orwell inspired characters (it’s a farce, remember?). A sports writer, he is in charge of writing pro-Bears propaganda (and believing it, too) and collecting reports on new mem-bears (sic). This is what gets him in trouble with the beautiful and mysterious Juila (Laura McKenzie), who opens his eyes to a world out side of bear nation, and who steals his heart. What all of this means to you depends entirely upon your experience as a Chicagoan, as a reader of classic science fiction, and as a sports fan. The audience I saw the show with adored it. They were enchanted by the familiar and obscure references that the play is laced with. I on the other hand am not, so was completely lost for a lot of it. 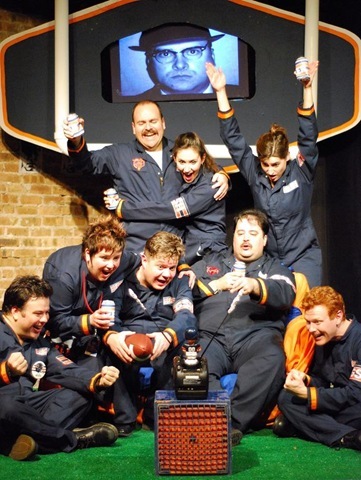 Judging from the amount of references to Billy Buckner, I feel safe in saying that this show was not intended for those of us not originally from Chicago without any sports knowledge or memories of years predating 1988. It’s hard to talk about such a personal show without personally responding to it. And what’s wrong with that? 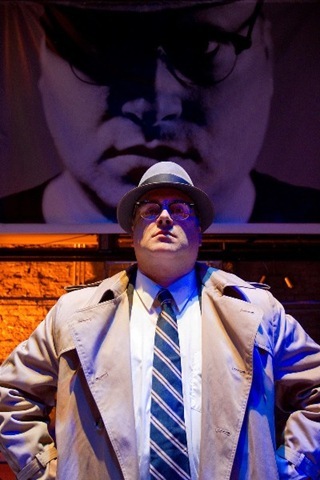 This show is unapologetically specific, local and esoteric; which is the best that theater can be. 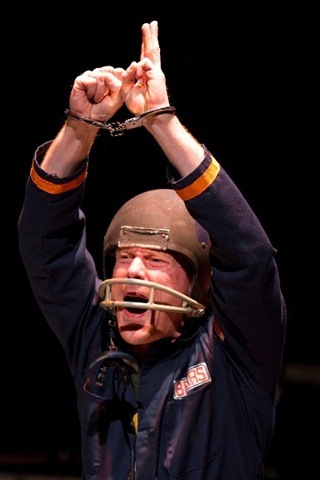 Theater does not and should not have the scope of its competing form of entertainment. It is a personal, local thing. This show will not be for everybody. But for some people, it will hit nerves that run very deep. 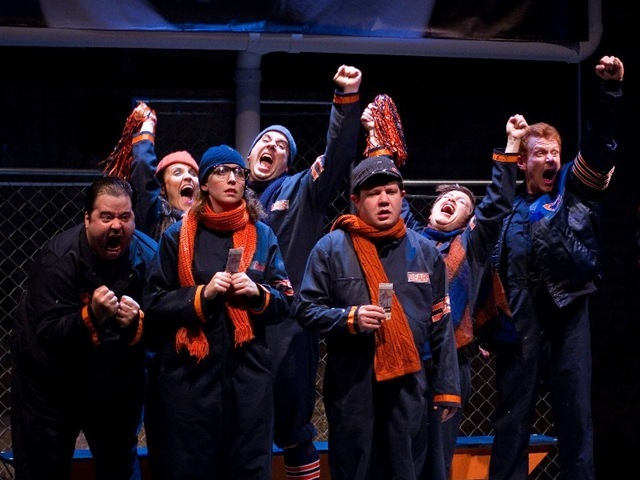 The play has clever ways of weaving Chicago Bearophillia into an Orwellian dystopia. First, it replaces Big Brother with “Papa Bear” George Halas (Ernie Deak), who owned the Bears until his death in 1983. It then turns Chicago into “Bear Nation,” where thoughtcrimes against the Bears are punishable by being sent to the dreaded and mysterious room 101. It saturates the dialogue with so many Bears puns that less than 15 minutes in, you can feel them coming and where. Finally, it shows Chicago hard-core sports fans for the brainwashed, cold-hearted intellectual slaves they sometimes appear to be. 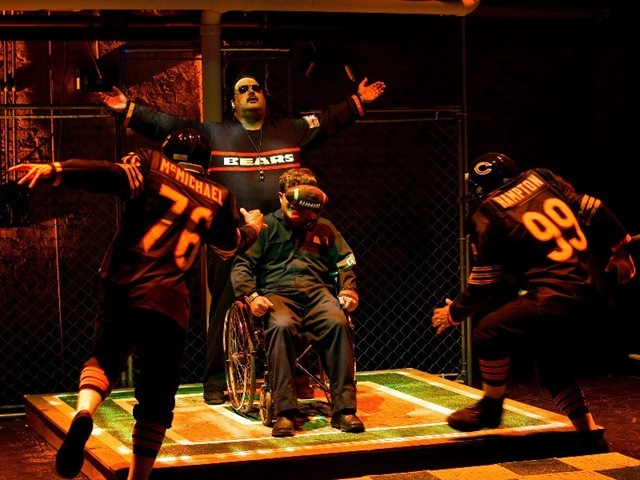 One of the best moments in the play comes after one character; a particularly devoted and disturbed mem-bear delivers a monologue explaining the camaraderie between the Cubs and the Bears. His conclusion is that cubs are baby bears, meaning that the two go together. He then rhetorically asks, “What goes with White Sox? White Hose? That would be better suited for describing their women!” which is met with cheers and applause by his brainwashed brethren. This moment is so shocking because the language is so course and out of place – especially falling on ears numbed by 45 minutes of Bears puns – that it totally encapsulates what is wrong with Chicago fandom. For those not from here, or with out the memories of 1985, the show may not hit home. But all who live in Chicago can relate to the dangerous peaks that fans climb to, the dangers of seeing black and calling it white, and more than that, believing it is white. The dangers in seeing a losing team and calling it a winner, and worse than that, believing that it is a winner. In that regard, maybe you don’t have to be from here to get it. It should be noted that Angelina Martinez’s set is wonderful, minimal, usable and clever, perfect for just such a small Chicago production.